Cytomax® Performance Drink is made for a different brand of athlete. Its blend of complex carbohydrates and sugars work to sustain energy, so you can train harder, build stamina, and achieve superior results - Proven Results! Exclusive to Cytomax products, Alpha-L-PolyLactate™ is a patented energy source proven to provide energy longer and faster. Cytomax lowers acid in muscles, which prevents burning and cramping during training and helps reduce soreness and speed recovery. Beats the Burn: Patented Alpha-L-PolyLactate™ buffers acid production in your muscles, reducing the “burn” during intense training and minimizing post-exercise muscle soreness. 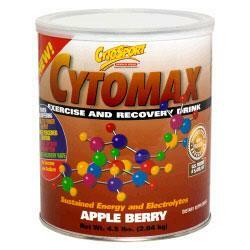 Buy CytoMax EXERCISE & RECOVERY DRINK Now!